The on-line registration is now open! Click on banner to register for the 2019 - 2020 HJB Travel Hockey Season. 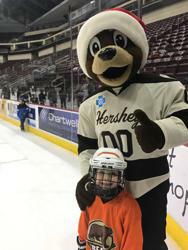 The Hershey Jr Bears are proud to announce the details of our 2019-2020 Travel Hockey programs. Please click on the image above for details on our Travel Hockey programs for ALL age levels. Thank You for your support of the HJB program and Let's Go Jr Bears!!! Congratulations to the HJB's U18 A team for earning second place overall in the DVHL Playoffs! Beginning Hockey skating classes are available! These lessons are developed in conjunction with USA Hockey and will develop or strengthen the skills needed for beginning and advanced beginning players. A look at the hockey curriculum is available clicking on the link below. In four badge levels, skaters will learn how to be more proficient and agile on the ice. Proper skating techniques for the game of hockey are the primary focus of the levels. All elements will be taught without a puck. Skaters will learn the basic hockey stance, stride, knee bend, use of edges and other necessary fundamentals to be successful in hockey practices and game situations. Use this LTS registration link, (click) for more information and be sure to select the Hockey Track when asked.